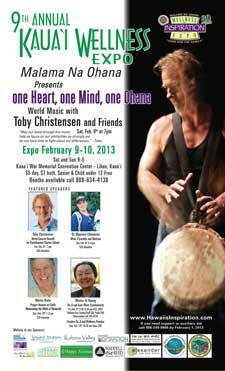 This year's Expo theme is Malama Na Ohana - Care for the Family. By planting the seeds to raise the island's consciousness on the importance of health, wellness and well-being, the Expo will expand the definition and conversation for a deeper community commitment to Kauai from the 'first breath to the last breath' of each individual. In alignment with the intention, this 9th Expo itself has evolved with a new consciousness and has expanded its breadth to showcase Kauai's cutting-edge community organizations and their innovative contributions to Kauai's healthy future - the Mayor's Holo Holo 2020, Kauai Hospice, Kauai Palliative Care and Share the Care, to name a few. Non-profits, government entities, businesses and private individuals are co-sponsoring the featured speakers. Partnerships include the Kauai Community College, Department of Education, the Kauai Aloha Foundation, Lihue Aikido Club, and Glenn and Marian Head. As an Expo initiative, coming together for the first time are "movements" (Palliative Care, Kauai Health and Wellness Association) and "systems" (DOE and government) creates an opportunity to meet, discuss and collaborate on future projects that will foster a healthier Kauai.